This panel will take place in the MAIN PANEL ROOM on Saturday from 6pm to 7pm. You do NOT want to miss this once-in-a-lifetime event as former Rangers reclaim their roles in the hottest Power Rangers story of all time! This year one of the biggest things for the Power Rangers brand has been both what BOOM! Studios continues to put out with the Mighty Morphin Power Rangers comics as well as the Twitch.TV Power Rangers HyperForce series. At this year’s San Diego Comic Con, BOOM! Studios is celebrating both of those things with these awesome exclusives! First up is the Mighty Morphin Power Rangers 28 Psycho Green Ranger cover. You can purchase this as a bundle with the exclusive Power Rangers In Space Legacy Psycho Green Ranger figure. NOTE! The Legacy Psycho Green Ranger figure is limited to 1500 pieces so good luck! Second, we have an exclusive Power Rangers HyperForce cover for Mighty Morphin Power Rangers Issue 29. This features the team, helmetless, taking in a moment under a starry sky drawn by Jordan Gibson. This, as the previous Power Rangers HyperForce cover, is going to be a quick sell! Finally, we have new lapel push pins exclusives! You can grab your Mighty Morphin Green Ranger pin, Ranger Slayer pin, Gravezord Pin, Lord Drakkon both in Evolution I form as well as Evolution II form. These are designed by Lucas Werneck and are guaranteed to be hot sellers. Stay tuned to more information on San Diego Comic Con 2018 from TokuNation.com as we will be bringing things to you LIVE from the show this year! 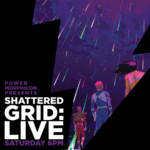 The Power Rangers HyperForce have suffered with their time in the Shattered Grid event for the Power Rangers comic books. Last week, our heroes arrived at New Tech City but it wasn’t the same New Tech City that they remembered – instead it was overrun with sentries bearing the look of the Mighty Morphin Power Rangers. Our heroes found an ally in Colonel Hicks as they planned to break prisoners out of a stronghold, retrieve data on Scorpina‘s plans, and help the Coinless continue their fight. SPOILERS FOR POWER RANGERS HYPERFORCE BELOW!!! Unfortunately, their plans were tragically ruined as Colonel Hicks turned out to be merely a shell of human flesh for the evil Pumpkin Rapper, who grew large and immediately self-destructed, killing most of the imprisoned civilians that the Power Rangers HyperForce were attempting to rescue. As our heroes learned of the fate of those they attempted to rescue, a ship landed and a figure clad in white stepped out – “Enough!” cried this figure, slamming a sword in to the ground. Tonight on Power Rangers HyperForce, Jason David Frank (the original Green Mighty Morphin Power Ranger) rejoins the cast of Power Rangers HyperForce making his debut appearance as the evil Lord Drakkon. 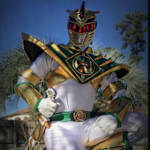 For those unfamiliar with Lord Drakkon, he is the future Tommy Oliver from Mighty Morphin Power Rangers who voluntarily chose to stay at the side of Rita Repulsa, helping her conquer most of the Earth and destroyed the Power Rangers. Those who remain call themselves the Coinless and their resistance battle is, at best, simply delaying the inevitable. The Shattered Grid event in the comic books features the return of Lord Drakkon, having broken free of his prison within the Prometheus, traveling through space and time to destroy ALL the Power Rangers once and for all. This is the Power Rangers event fans have been clamoring for. This event will forever change the Power Rangers as we have all come to know them as, and not everyone is going to survive the fight. Will the Power Rangers HyperForce be able to stop the evil Lord Drakkon? Will they be able to stop Scorpina from using Serpentara to destroy an entire coast of the United States? Will any of them make it out of this alive? Tune in to Power Rangers HyperForce on Twitch.TV via Hyper RPG at 6pm PST and find out! At this year’s WonderCon 2018 the Power Rangers HyperForce will be getting their own exclusive cover for Go Go Power Rangers Issue 08. Revealed today by Meghan Camarena, @Strawburry17 on Twitter who plays Chloe the HyperForce Pink Ranger, is the exclusive WonderCon Power Rangers HyperForce Comic Cover. We can’t wait to add this to our collection! It will be exclusively available to attendees at this year’s WonderCon 2018 happening March 23rd through March 25th in Anaheim, California. On the latest episode of Power Rangers HyperForce – a Twitch.TV table top RPG game streamed live to audiences – Misty Flores from Saban Brands joined during a break to make some big Power Rangers HyperForce announcements. 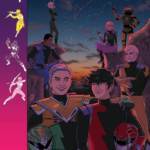 Power Rangers HyperForce will be at WonderCon – March 23rd through March 25th in Anaheim, California – to do autograph signings and meet the fans. The team will also be featured on an exclusive variant cover of the Go Go Power Rangers comic book (issue 08) to WonderCon! On the next episode of Power Rangers HyperForce – streaming live on Tuesday, March 13th – the team will find themselves involved in the Power Rangers mega-event the Shattered Grid coming from comic publisher BOOM! Studios. To top it off Kyle Higgins, writer of the Mighty Morphin Power Rangers comic, will be the special guest and has co-written the story of the episode. On top of that, GM Malika Lin will also be a character in the story, leaving Zac Eubank (CEO of Hyper RPG) to GM the episode. 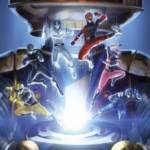 Also teased was a big Shattered Grid panel at WonderCon, one that fans will NOT want to miss! More announcements are teased for next week as Power Rangers HyperForce kicks off the Shattered Grid event! Don’t miss it – we’ll keep you updated leading up to it! Our friend Hassan Ahmed (the Internet Sensation Sweeping the Nation, HA!) and his channel The World of HA on YouTube, got the distinct pleasure of interviewing Peter Sudarso. If you’re living in a cave on the Island of Despair, Peter Sudarso plays both Preston the Power Rangers Ninja Steel Blue Ranger (airing on Nickelodeon) as well as Marv the HyperForce Red Ranger on the weekly tabletop RPG series Power Rangers HyperForce on Twitch.TV! It’s an informative interview and gives you both the opportunity to dive in to Peter’s thoughts on Power Rangers as well as the behind the scenes details on Power Rangers HyperForce! Check out the video below! Power Rangers Super Ninja Steel airs every Saturday morning on Nickelodeon! Check your local listings for exact times. Power Rangers HyperForce streams live every Tuesday evening from 6pm PST to 9pm PST on Twitch.TV. Check out the HyperRPG channel by clicking here! Power Rangers Hyperforce is ALL NEW Tonight – Catch Up on Last Week’s Episode! Tonight a brand new Power Rangers Hyperforce streams live on Twitch.tv! Before the new episode airs, take some time to catch up on last week’s episode, now available for everyone on Hyper RPG‘s YouTube channel! Check out the episode below! Be sure to catch the brand new episode of Power Rangers Hyperforce at 6pm PST on the Hyper RPG Twitch live stream by clicking here! Power Rangers Hyperforce is a tabletop RPG designed specifically for Power Rangers! In partnership with Saban Brands, Power Rangers Hyperforce is a direct sequel to the fan-favorite Power Rangers Time Force series. Five Time Patrol cadets are tasked with traveling through time to stop the Alliance of Evil! As they continue to travel through time new reveals are made regarding just what the Alliance of Evil is up to! What will happen next? Tune in to a brand new Power Rangers Hyperforce and find out! Be sure to discuss the latest episode in our discussion thread! Tonight was the premiere of the Power Rangers HyperForce via Hyper RPG on Twitch.tv. For three hours viewers were treated to a new story in the Power Rangers universe set in the year 3016 at the Time Force Academy. Returning and reprising her roll as Jen Scotts, the Time Force Pink Ranger, was Erin Cahill as a guest participant. To get a quick recap, click “Read More” and then join in the discussion! All times are GMT -4. The time now is 6:25 PM.